We are open seven days a week, 10:00 am to 5:00 pm, except Thanksgiving Day, Christmas Day, New Year’s Day and Easter. Winter hours of 10:00 am to 4:00 pm are in effect from December – February, returning to regular hours March 1st. All tours of the Museum and Birthplace home are self-guided. Staff will be available in both locations to answer questions. The Museum and Birthplace house are handicap accessible. Tickets are purchased at the Birthplace Museum at 205 S. John Wayne Drive, at the corner of John Wayne Drive and Washington Street. We are conveniently located just 14 miles south of I-80 (take US Hwy 169, Exit 110) and 14 miles west of I-35 (take Iowa Hwy 92, exit 56). Take Exit 110 (US Highway 169) south through DeSoto and follow it approximately 14 miles into Winterset, where it becomes John Wayne Drive. Stay on John Wayne Drive one block past the Courthouse Square. 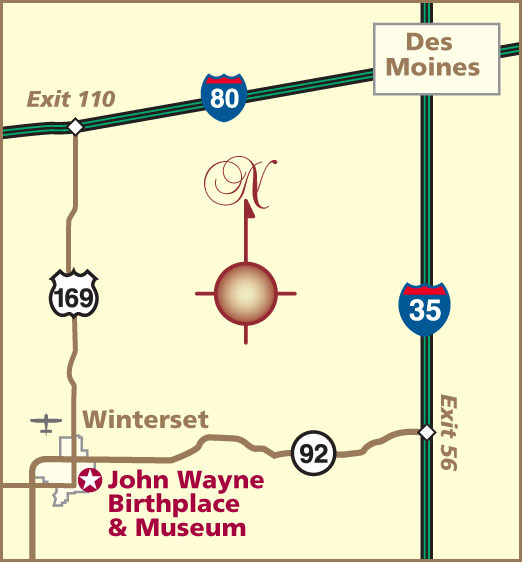 The John Wayne Birthplace Museum is on the southeast corner. Take Exit 56 (State Highway 92) west approximately 14 miles to the junction with U.S. 169 in Winterset (there’s a Hardees restaurant on the corner). Turn left (south) onto John Wayne Drive. 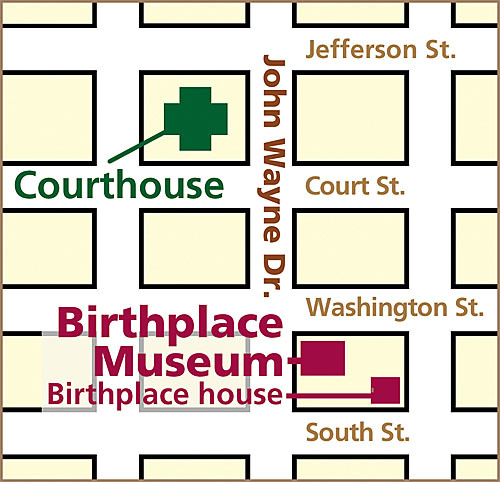 Stay on John Wayne Drive one block past the Courthouse Square. The John Wayne Birthplace Museum is on the southeast corner. Motorcoach tour groups: (20+) $10.00 per person (call to arrange). The John Wayne Birthplace & Museum does not disclose any nonpublic personal information about our customers or former customers without their permission, to anyone except (1) as absolutely required by law; (2) as needed by our employees to provide services or products to you; (3) to financial service providers as we, in our judgement, deem may be worthwhile to you. We maintain physical, electronic and procedural safeguards that comply with federal regulations to guard your nonpublic personal information.